Two of the EISCAT radar transmitters are located in Ramfjordmoen, close to the city of Tromsø in Norway. 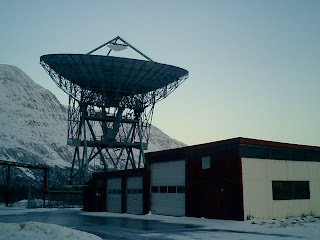 The people working here are employed by The University of Tromsø. 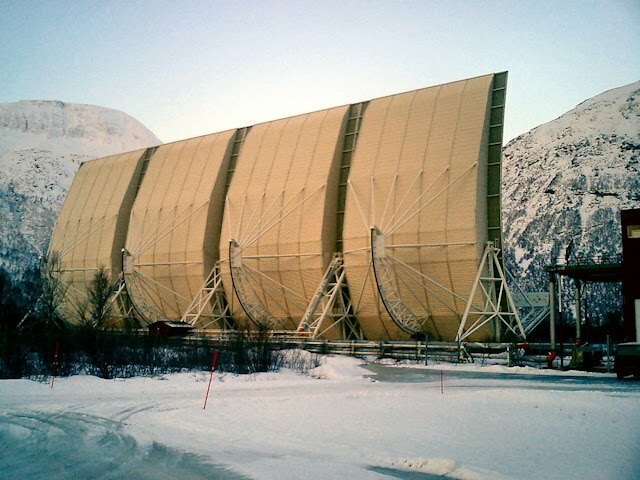 The EISCAT UHF (Ultra High Frequency) radar operates at 931 MHz and is driven by two klystrons with a peak transmission power of 2 MW. The antenna is a 32-metre diameter dish, which weighs about 100 tonnes. It is fully steerable, and can scan at speeds of 80 degrees per minute in both the azimuth and elevation axes. It can accelerate to full speed within 2 seconds. The other radar is the VHF system, shown in the second photograph. This is a 120×40 metre antenna with a 224 MHz transmitter. 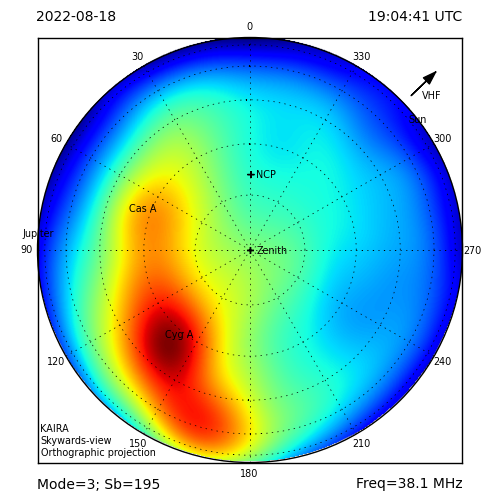 This radar is of particular significance to the KAIRA project, so we'll write about it in full tomorrow. 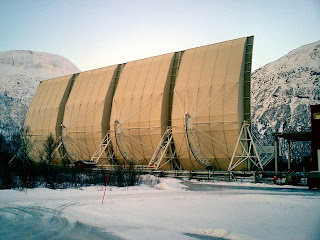 In addition to the radars, there is a Heating Facility, which is used for modification experiments. 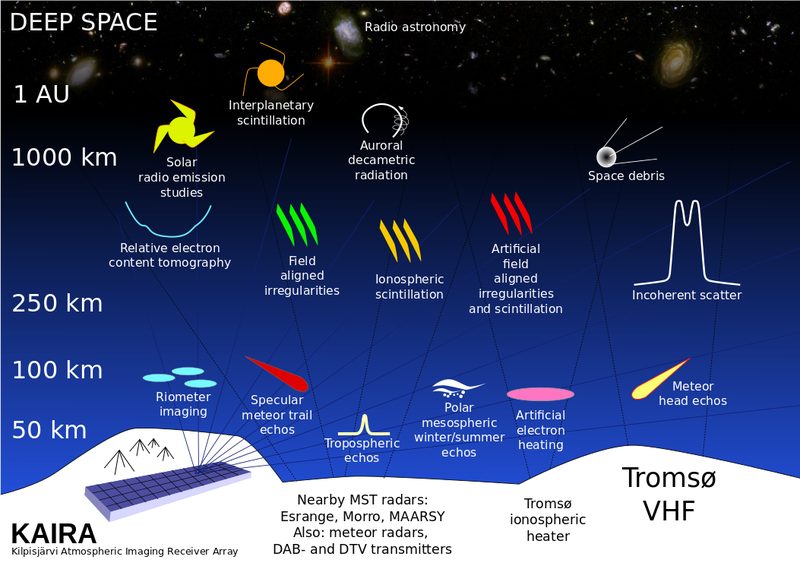 It applies high-power transmissions of high-frequency electro-magnetic waves to the ionosphere to study its plasma parameters. The name Heating stems from the fact that these high power electromagnetic waves, which are transmitted into the ionosphere with high-gain antennas, heat the electrons and thus modify the plasma state. To create plasma turbulence, the transmitted frequencies have to be close to the plasma resonances, which are 4 to 8 MHz. There is also a Dynasonde (a digital HF sounder) covering a frequency range of approximately 1-20 MHz. Six dipoles are used as spaced receiving antennas. Each half of each dipole is made from an aluminium tube, 11 metres long and 15 centimetres in diameter. These tubes are suspended about 2 metres above the ground. Even so, they do break sometimes through weight of snow and metal fatigue as they vibrate in the wind. But there will be more about the VHF system tomorrow!